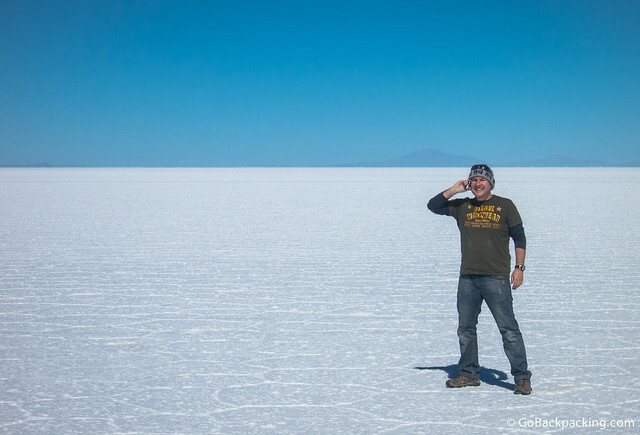 Editor’s Note: This is the third post in a three-part series from Dave’s trip to the Bolivian Salt Flats. Read part one and part two. 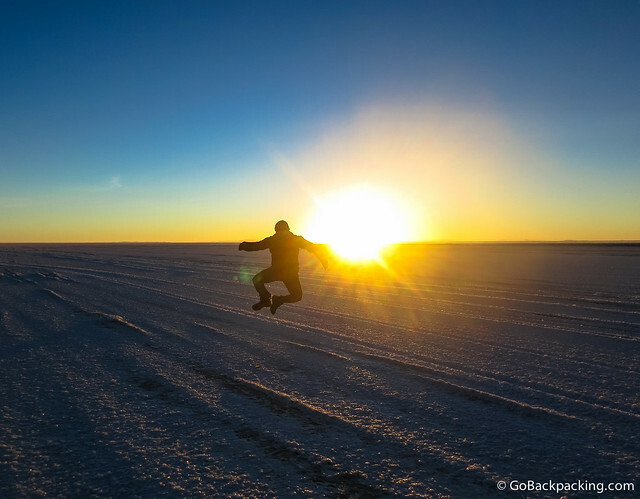 It was supposed to be a highlight of my travels in South America, but excitement quickly gave way to a sinking feeling as we veered off the elevated dirt road, and onto Salar de Uyuni, the world's largest salt flat. 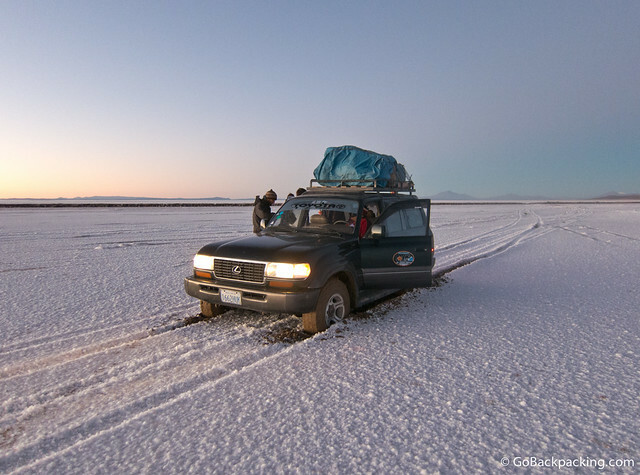 Within 60 seconds of our transition from dirt to salt, the Lexus SUV we'd used to cross southwestern Bolivia came to a complete stop. Our driver, Pedro, attempted to accelerate, but it was no use. 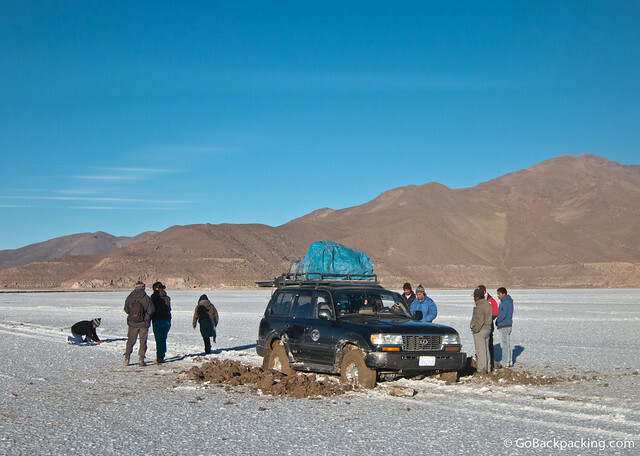 The salt crust ranges in thickness from a few centimeters to a few meters, and we drove directly into a shallow spot. 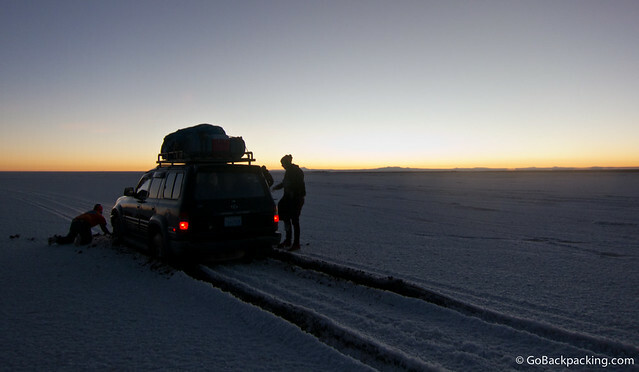 The weight of the fully loaded SUV was too much, and we had quickly broke through the salt layer, only to sink in the mud beneath. In an unforeseen instant, the entire day I'd been waiting years to enjoy was in jeopardy. We'd risen early, at roughly 5 AM, to pack our backpacks and get an early start on the day. The goal was to have a tailgate breakfast on the salt flat while watching the sunrise. Pedro was outside packing the SUV in the pitch black and bitter cold. Unbeknownst to us, it was his birthday, and his friends had taken him out to celebrate while we'd been sleeping. A few bottles littered the front passenger seat, leading to an uptick in my anxiety. Despite my best attempt to secure a responsible and safe driver, I was now in the position of going with someone who at best seemed as though he didn't get much sleep, and at worst, was still a bit buzzed from the birthday celebrations. Up until this point, I'd been 110% satisfied with his driving and vehicle. It may seem hard to believe, but it doesn't even take a drunk driver for accidents to occur in one of the world's flattest places. Lack of sleep, speeding, reckless driving and unexpected changes in terrain have led to a series of fatal crashes involving several dozen tourists since 2008. I don't share any of this to scare people, but it's important to recognize the inherent dangers of traveling in this remote region. 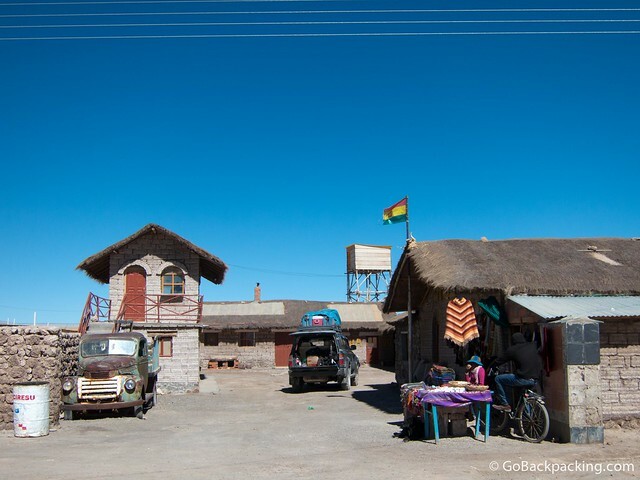 If you're paying $125 for a three-day trip, the average Bolivian driver is not going to have a satellite phone in case of emergency, first aid training, or even a first aid kit. To travel with these higher safety standards, you have to pay more and book your trip through a Western-owned tour operator. The drive from the salt hotel to the elevated road that extends into the salt flats took about thirty minutes. Once Pedro had surveyed the SUV, he got down on his knees and began to dig the mud out around the front left tire by hand. I was surprised he didn't carry a shovel given we spent the first two days entirely off-road in very remote areas. 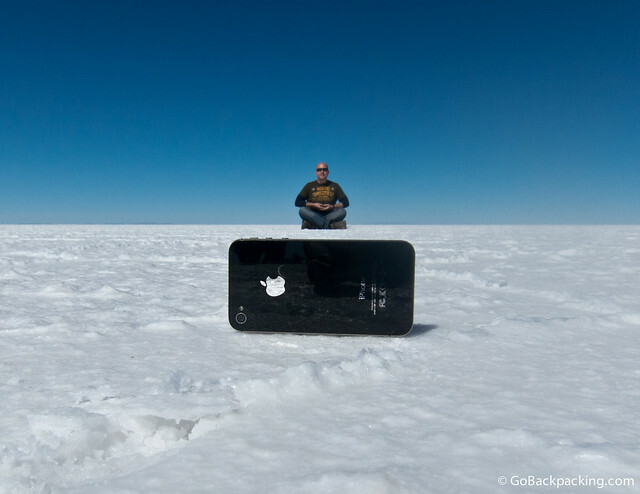 Without the sun, the temperature on the salt flats was still bitterly cold due to the 3,656m (11,995 ft) elevation. I put on my alpaca gloves and began to dig around one of the rear tires. He quickly waved me away, but not before I got a feel for how heavy, wet and cold the mud felt. It was clear pride trumped expediency, so myself and the others were left to stand around and wait. If there was a silver lining in getting stuck, it was that it happened 60 seconds off the elevated road. We could clearly see other SUV's passing by, and they could clearly see us. Within 10 minutes, an SUV had stopped, and a group of Bolivians had walked over to see how they could help. At 7 AM, as the big dig continued, the sun finally broke over the horizon, momentarily taking my mind off our situation. The sky quickly turned bright blue; the sun's warmth felt reassuring. Simply digging the mud out from around the tires, and throwing some chunks of salt in for traction wasn't enough. The SUV went nowhere. By this time, another SUV had stopped, bringing our headcount to at least a dozen Bolivians. One of the men had brought a shovel, which sped up the digging process, and spared Pedro's hands, which were by this time covered in a thick cake of mud, and dangling lifelessly at his side. Several young women began quietly carrying stones from the elevated roadway in their shirts, while the men stood around strategizing. Placing the rocks against the front and back of the tires didn't work either. The SUV was still having trouble gaining traction. The strategy evolved one step further when the propane tank we were carrying for cooking was used as a base for the tire jack. By placing the tank next to each tire, and then elevating them one by one using the jack, it was then possible to place rocks directly beneath them. This made all the difference. Once there were rocks underneath all four tires, Pedro took the driver's seat, pressed the gas pedal, and the SUV rolled onto what was clearly a thicker crust of salt directly in front of us. Though it felt like an eternity, the delay had only cost us an hour and twenty minutes. But without the kind help of the other Bolivians, it would've been much longer. With the SUV back on solid salt, Pedro wiped the mud off his arms with a rag, flipped open the tailgate and set out a giant round loaf of fresh bread, granola, cookies, yogurt, juice and instant coffee. It was only then, when we began eating, that he put his head down on his arms on the SUV's hood in what appeared to be a giant sigh of relief. We asked if he was OK, and he nodded yes. We were back on track. After breakfast, I climbed up on the SUV's roof rack to help secure everything. Pedro was normally the only one to go up there, but it was clear he needed the help. The rocky island which means “Inca House” or “Home of the Incas” covers just 61 acres out of the 10,582 square kilometers that is the Salar de Uyuni. 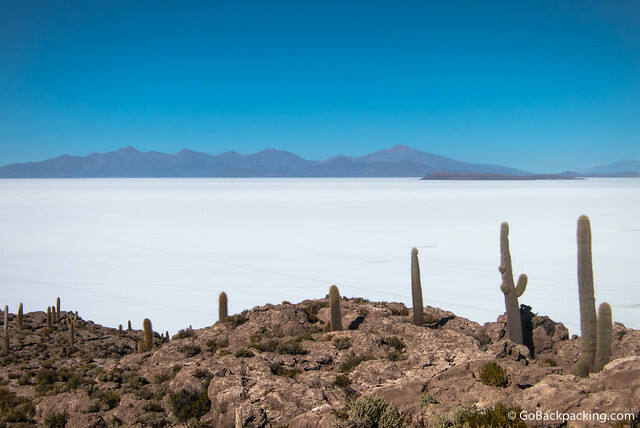 In addition to its use as a refuge for the ancient Incas who use to cross the inhospitable salt flat, it's home to birds, Vizcacha and Giant Cactus, one of which was 9m (27ft) tall, and 900 years old. Climbing up the hill requires a little effort given the altitude, but the 360-degree panoramic view from up there makes it a worthy endeavor. Entrance onto the island cost 30 Bolivianos ($4.35). We spent a little over an hour at Isla Incahuasi before driving fifteen minutes out onto the salt flat again. I don't know if it's a matter of routine, or he was feeling bad about us getting stuck earlier in the morning, but Pedro offered to let me drive the SUV. He was proud of his Lexus (the only one I'd seen in three days), so it felt like a big deal for him to be handing over the wheel to me. I purposefully drove much slower than him, given I wasn't familiar with the handling of the SUV when fully loaded, nor the terrain. He offered the same opportunity to everyone else, but only two of other five travelers accepted. After our joy rides, at around 11:30 PM, Pedro stopped the SUV in an area we had to ourselves, and said we had 30 minutes to take photos. This was the moment I'd been looking forward to for years, but it was only then that I realized I was the odd man out. The three British backpackers immediately went off to take funny photos of each other, and the French couple didn't even know about the trick photography that was possible here! I did my best to explain, and then spent a lot of time running back and forth between the place where I had to pose and the props in the foreground where the Frenchman was also taking the pictures. I realized I didn't know the best way to be capturing these photos. I'd seen other people's images but had not done any research on the best way to take them. I'd left it up to trial and error, and now I didn't even have as much time as I expected. Pedro was on a mission to deliver us to Uyuni on schedule at 3 PM, but due to us getting stuck earlier in the morning, he had an hour and a half to make up. I felt rushed and annoyed. I continued trying to squeeze in more photos, buying myself an extra few minutes to Pedro's consternation. With everyone else seemingly happy to get back in the SUV after 30 minutes, I had no support to stay any longer. After 40 minutes, we were on our way off the salt flat. Before we arrived back on regular land again, we passed through the salt mines at the edge of the salt flat. The world's largest salt flat contains about 10 billion tons of salt, of which 25,000 tons are extracted annually. 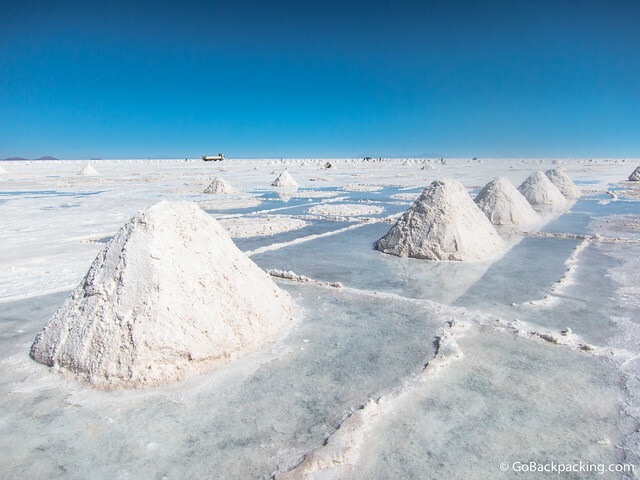 It's also estimated that beneath the salt surface lies 50 to 70 percent of the world's lithium reserves, or as much as 100 million tons. By 1 PM, we'd departed the salt flat, and entered a village. Pedro parked the SUV outside a small complex of buildings, and began to prepare lunch. His car was completely covered in a thick film of white salt, which must be brutal on the paint if it's not washed off quickly. Lunch consisted of chicken, pasta, potatoes, and a mix of carrots and string beans. 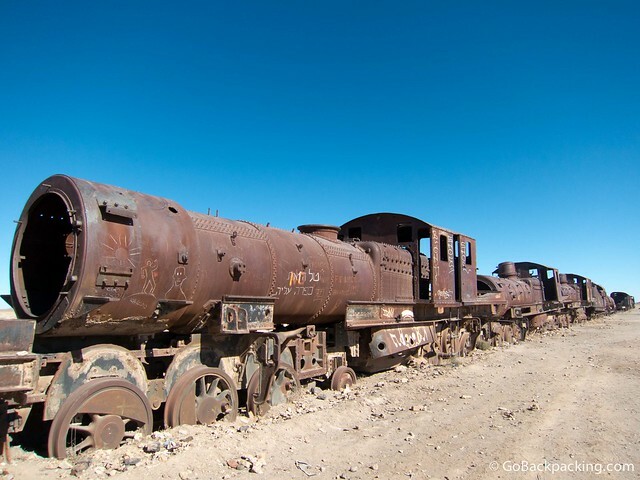 Our final stop of the day, and trip, was the Cementerio de Trenes (“Train Cemetery”) located 3km outside of Uyuni. The train lines were built by the British from 1888 to 1892, and primarily used for mining purposes. They were frequently sabotaged by indigenous people, and in the 1940's left to rust in the salty winds after the mining industry collapsed. Today, the old rusted trains offer visitors the chance to be kids again, if only for a few moments, as they climb aboard and pose for photos. On the drive to Uyuni, we passed acres of dry shrubs with thousands of plastic bags caught amongst them. The massive amount of litter was a shock after coming from the unspoiled landscapes of the last few days. Pedro dropped us off outside the Immigration Office, which was closed. I was anxious to pay my $135 visa fee, get my passport back, and head to a lower altitude as my fingers still hurt, but it would all have to wait until morning. 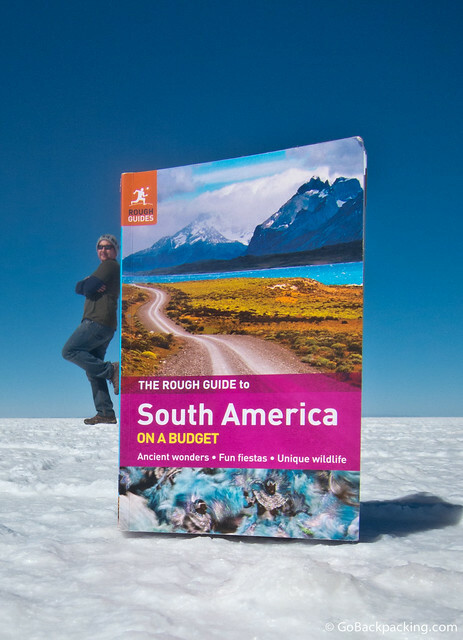 I think you did well with the photos given the rush, the rough guides one is cool! Thanks Poi :) I had some other props too, but none of those photos turned out well. Such an unfortunate start to your day Dave but it looks like it recovered well and you had a lot of fun taking those photos. I especially love the guide book one. Very inventive! In hindsight, have you any recommendations for taking these photos now or where I could do my own research before I visit later this year? 1 – Have a list of shots you want in mind ahead of time (check out this Mashable article for ideas). 2 – Bring props with you, or find them along the way. 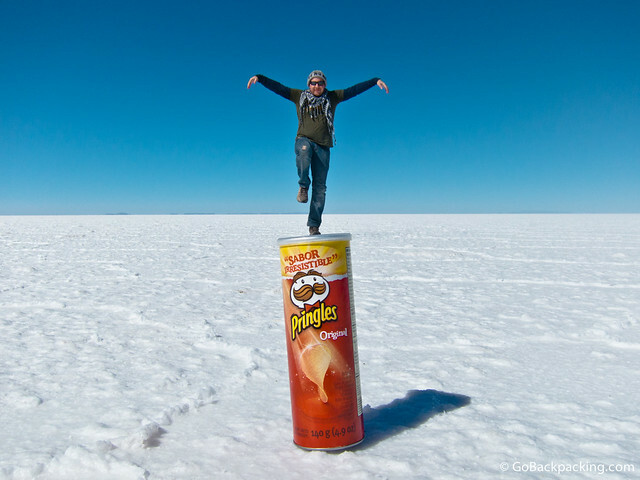 I bought the can of Pringles at the hot springs stop because I knew I’d want to use it for photos when we got to the salt flats. 3 – Try and get the other people you’re traveling with on board with your shot list (this is easier if you’re traveling with a friend or partner). Worst case, your driver will have taken tons of these photos before, and can help out. My driver helped me on a few shots, but I’m not sure if those are the ones that came out well. 4 – The photos are simple to set up. You keep the props (or in some cases, one or more people) in the foreground if you want them to look big, and send another person or persons 10 or so meters behind them to give the appearance they are small. The photographer made need to lie on his/her stomach in some instances. 5 – The hardest part is getting your camera to show subjects in both the foreground AND background in focus at the same time. I had some photos where one or the other was out of focus, and it ruined the shot. The best thing you can do plan your shots ahead of time, which will allow you to make the most of your photo stop. Every driver is different, but it might be worth talking to him ahead of time and explaining that you (and the group, if you get them on board) want as much time as possible for photography. He can then reduce the time at another stop on the itinerary if necessary to compensate. Awesome – thanks for the tips Dave! 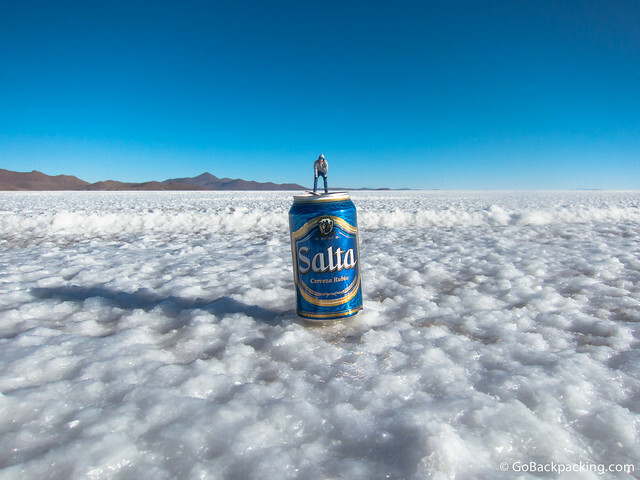 Oh, I DREAM about one day visiting the salt flats of Bolivia. When I see pictures as gorgeous (and innovative!) as yours, I’m reminded how I really should put this at the top of my bucket list. What an otherworldly place. Thanks Christina :) I felt the same way seeing my friends post their photos over the years. The scenery spoils you! The salt flats were definitely one of my highlights of my trip around Bolivia. The perspective that the landscape gives for photograph purposes. Some people take rucksacks full of tools to get better pictures but personally I wouldn’t do that. Good Pics. Thanks Adam. Yea, I like to travel light so I still use a pocket-size camera, but I’m sure plenty of photographers pull out the tripods and such. It’s a unique part of the world, can’t blame them!